I am beyond excited today! When I was growing up, I enjoyed looking through 2 storage closets my Grandma had in her house. I remember being around 10 or so, and spotting a vanity all the way in the back of one of the closets. I couldn't see too much of it, as it was hidden behind and under boxes and other storage, but I told my mom that I liked it. She said it was too old and it needed a lot of work. So I didn't get it. Then as a teen, my tastes started to shift towards a more modern look, so I quit thinking about it. When my grandma passed away 9 years ago, furniture was the farthest thing from my mind. Within the past couple of years, my tastes in home decor have been changing again. Now I find myself drawn to older pieces that have a history. The vanity crossed my mind again, and I wished more than anything that I had it, but I figured it was probably sold or donated, and long since gone. Last night my aunt texted me a couple of pictures. 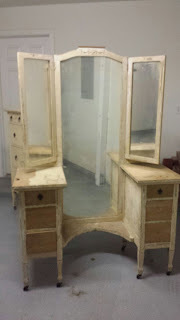 There was an old dresser and vanity. My first thought was that she had something for me to refinish and sell. But then she said they were my grandma's. That's when it clicked that I was looking at the very same vanity that was in the back of the closet. In all these years, I've been assuming it was gone, and never thought to ask my aunt if she knew anything about it. It turns out, the vanity and a matching dresser have been at her house. And now, she's offered them to me. 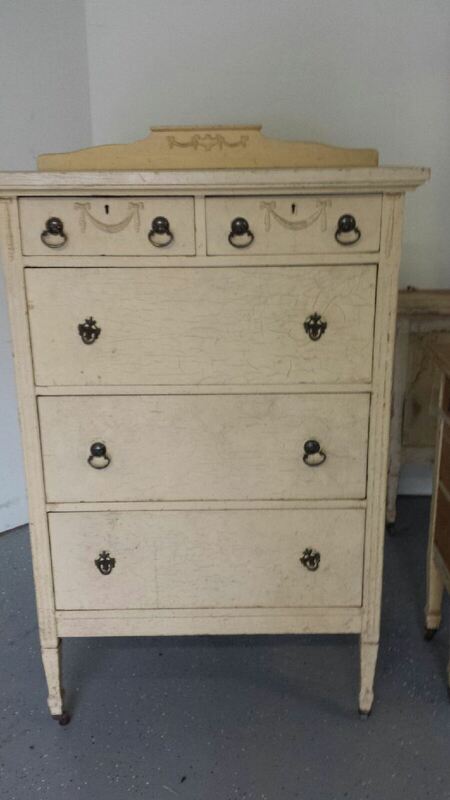 The dresser looks like it's in pretty good shape, but it's hard to tell from this photo. I don't remember the dresser in the closet, but I'm sure it was back there somewhere. I love its high legs. And here's the vanity. Apparently, it was originally my great-grandma's, who then passed it on to my grandma. My aunt remember my grandma sitting at the vanity, brushing her hair. My grandma was gorgeous, by the way! You can see her here. It looks like it still needs a lot of work, but I'm willing to do whatever it takes to restore it. They're manufactured by Unagusta. 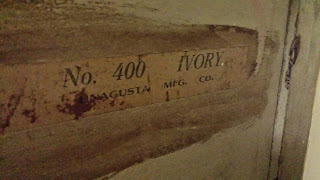 I did some really quick research and found out that Unagusta was a furniture company in North Carolina that folded in the mid 1930s. I'll look the pieces over for more stamps and signs when I receive them to see if I can discover anything else about them. I can't wait until I get them! I still can't believe that they're not gone, and that they're actually going to be mine! And now, I'll not only have a few antique pieces in my room, I'll have pieces that belonged to my grandma and great-grandma, which is probably the coolest thing ever! It makes something so much more special when you have actual ties to it, so I know these pieces will be something I always treasure. I'll definitely post more pictures as soon as I get them, but if anyone has any information on Unagusta furniture, or owns any pieces of their own, I'd love to hear about it! Hi fellow Dallasite! I will definitely appreciate and love them! I'm counting down the days until I get them! Thanks for stopping by! My grandfather along with his brothers and their father (R. L. Prevost) owned and ran Unagusta. We are fortunate enough to have several pieces. I troll the internet regularly looking for pieces; that is how I found your post. Unagusta operated into the 50's The factory sustained a large fire; none of Pop's grandchildren showed interest in running the factory, so it was sold. Laura - I'm so glad you found this post! Thank you so much for the info on Unagusta - I found a lot of conflicting info online, so it's wonderful to have it all cleared up! I also have a vanity from Unagusto. I am currently in th process of chalk painting it. It was my great grandmothers and had been neglected for many years. It held up pretty well considering it's age and the amount of use it rec. Ill try to post phot's when it is completed. Laura, can you provide more history on the company like when it was established? The veneer peeled off of the drawers too. I sanded, filled in small holes with putty, used a stencil and filler to create a raised design in the front and chalk painted it with a champagne color then antiqued it with brown and clear finishing wax. Finished with new cut glass drawer pulls (handles) I am so happy to own this piece as it is a part of my family history. I too inherited a 3 piece Unagusta bedroom set from my grandmother, Victoria. She was an very interesting lady and had a great story about the ticket she purchased for the maiden voyage of the Titanic...luckily for her (and me) she didn't make the trip. The set is in pristine condition, but it doesn't fit the style of our cottage on Cape Cod. So we're looking for a new home for it. I've attached a photo of the two mirrored dressers. Inside one of the drawers I found the label "Unagusta No. 80 Combination Walnut Veneer and Gumwood". I have the matching headboard & foot board for the set too.. Any ideas? Richard, you have peaked my curiosity!! My email address is LCSmith224@gmail.com I would love to know where you are and if you would be interested in selling.